Steven Dyme, Flowers for Dreams | Be Like Peter. 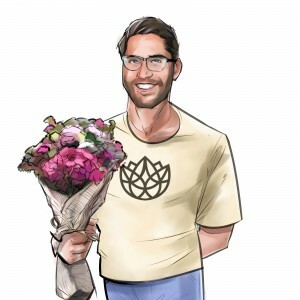 Steven Dyme is the CEO and Co-founder of Flowers for Dreams. Its aesthetic is quite dreamy, and they actually contribute to dreams by donating a portion of each bouquet’s proceeds to a local charity. Steven’s favorite flower changes with the season (as do their bouquets). At the time of the interview, it was poppies. Steven is very transparent that the reason for getting into flowers has nothing to do with a love or passion for flowers. He’s not an artist turned businessman; he is a businessman turned flower expert. They began partnering directly with schools to sell flowers inside commencement ceremonies (instead of just standing outside); and to attract the business of the schools and customers, they donated a backpack of school supplies for each bouquet sold. From doing that, they realized they’d stumbled across a market that was under served in many areas. They learned that there were no good flower options at low price points. If you wanted to pay less, you got crap; and if you wanted something nice, you had very limited expensive options that rarely delivered outside their neighborhoods. Flowers for Dreams starts all their bouquets at $35/bouquet and offers free delivery within Chicago. How can they accomplish all that? The goal of Flowers for Dreams was always to “provide great flowers at a reasonable price point”. To do so, the team realized they needed to focus on 1) eliminating waste and 2) controlling the process and margins. Apparently, in 2011, the Society for American Florists reported that the average spoilage rate for florists was a whopping 37%. “That’s the cost of doing business. 1 out of every 3 stems is dying before sale!” Steven reports that Flowers for Dreams spoilage rate is closer to 4-5%. To reduce the average industry waste, Flowers for Dreams does a lot of complicated things, but 2 conceptually simple things. 1) They buy from local markets every day and offer an essentially “just-in-time” service 2) They limit the inventory required by offering fewer options – a menu of 6-8 bouquets that have specific designs, but not necessarily specific flowers. Through growing Flowers for Dreams, Steven has become obsessed with the visual design of their brand, as is evident by their products and marketing. The team recognized that no one was giving for giving in the industry. Integrating social consciousness didn’t really exist in the floral industry when they introduced it. Each month Flowers for Dream partners with a local charity, and with each new partnership they are making a higher dollar impact than the month before. As a young entrepreneur, Steven has learned that you shouldn’t be afraid. Flowers for Dreams is currently working on expansion, a new round of funding and delivering bouquets all over the city. If you’re buying flowers for your mother, Steven recommends their newly released Spring bouquet.